You already employ a VP of Marketing & Sales. Their name is your website. In 1995, if a potential customer of yours wanted to find out some more information about your product and business, they would need to call your sales team and have a conversation. No one does that anymore as the first point of call. According to HubSpot, 71% of B2B decision makers start the decision-making process with a general web search. In simplest of terms, this means that those people back in 1995 who would have called you are instead searching on Google first. Therefore if you have people landing on your website, you must remember that your website is the first impression of your business they receive! It's time to think of your website as your best performing employee, and take advantage of the fact that it doesn’t go home, doesn’t go on holiday, doesn’t get sick, and is always online. 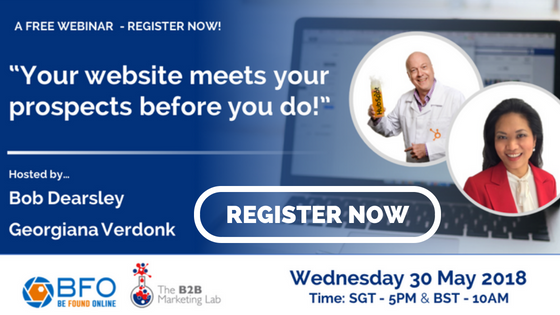 As I have mentioned previously – and will mention again – your website meets your prospects before you do. It is your chief salesperson and no doubt has the most engagement with your prospects. This is precisely why you should have a website. If you accept this simple fact, you will appreciate that in order to get prospects to engage with your business and actually generate leads, your website needs to be set up to educate, help and advise people who arrive on it. Think about how you as a marketer or salesperson would speak to a prospect. Think about how you would educate them and encourage them to consider your products and/or services. For any prospect, you would share quality content with them to help them understand their business pain, identify potential solutions, and then make an informed purchase decision. Now structure your website in the same way. Create new, search engine optimised content (blogs, eBooks, web pages, case studies, product pages) to help prospects to find your website; include chat functionality so prospects can get in touch with your team to find out more rather than just speak to a salesperson; and make it easy for your prospects to find what they are looking for on your website. The benefits of having a website are clear. Having a ‘contact us’ page is not enough. Today’s prospects don’t want to talk to a salesperson unless they are ready to make a purchase. Your website needs to be a hub of information. Use your buyer personas to anticipate your prospects’ questions and create content that provides answers to those questions. Instead of telling prospects everything they need to know down the phone, put all that information on your website. There’s nothing worse than a convoluted, difficult-to-navigate website. Prospects arriving on your website want to be able to find what they are looking for with ease – if they can’t, they’ll leave and go elsewhere. Your most important information cannot be buried deep in your website. Make sure your navigation structure includes your most important pages and that your content assets can be readily found by interested parties. What if a prospect reads a blog on your website and wants to find out more on that exact topic or more about similar topics? Content is the best collateral a salesperson has. If your website does not provide any additional, relevant content that they can engage with, you are missing out on opportunities to nurture prospects and move them through your website. Having a simple pop up box or CTA at the end of your content that recommends another piece of relevant content to the reader can do wonders for your lead generation and lead nurture activity. Your website is the first impression your prospects have of your business – and too often I see B2B websites (especially in the tech space) that have not considered the clarity of their messaging or taken the time to condense their messaging for their target audience. If your prospects arrive on your website and do not understand what it is you do, they will click off it and check out your competitors. The more your prospects can understand your business – and the more you can show you understand them – the more invested and interested they will be. Your website is not a static brochure – it is an evolving asset that tailors itself to the needs and expectations of website visitors. If you have the right automation built into your CMS, you can make it so that your website alters itself based on who is viewing it. This puts you in an excellent position to sell to and nurture specific prospects. In the world of B2B marketing and sales, your website needs to be a resource of valuable, high-quality information – it needs to have everything your prospects need to make an informed purchase decision. It’s just not practical or effective for you to put all of your product information on one page and expect potential prospects to reach out to you. In B2C, a simple one-page website is very much acceptable, people want a product you sell and you provide them with a way to buy that product. In B2B, the purchase decision process is much longer and your prospects want to understand more about your business, your products and services, and why you can solve their business problem. Your website is integral in the process and will never let you down if you invest in it and set it up to engage with prospects when they arrive. No more wondering why you should have a website. 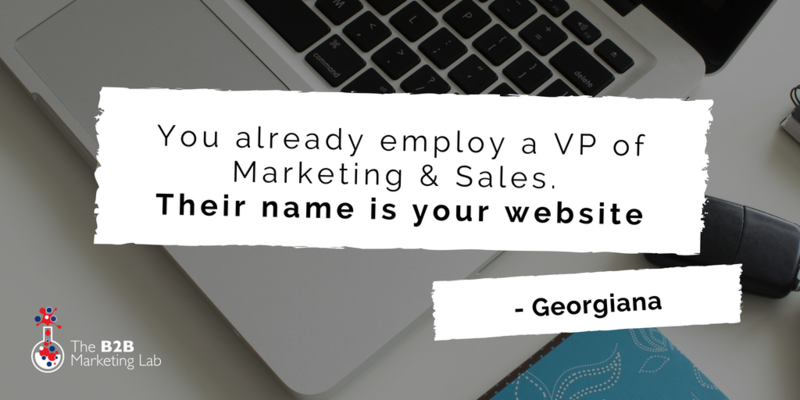 If you haven’t already – promote your website to VP of Sales and start using it properly!